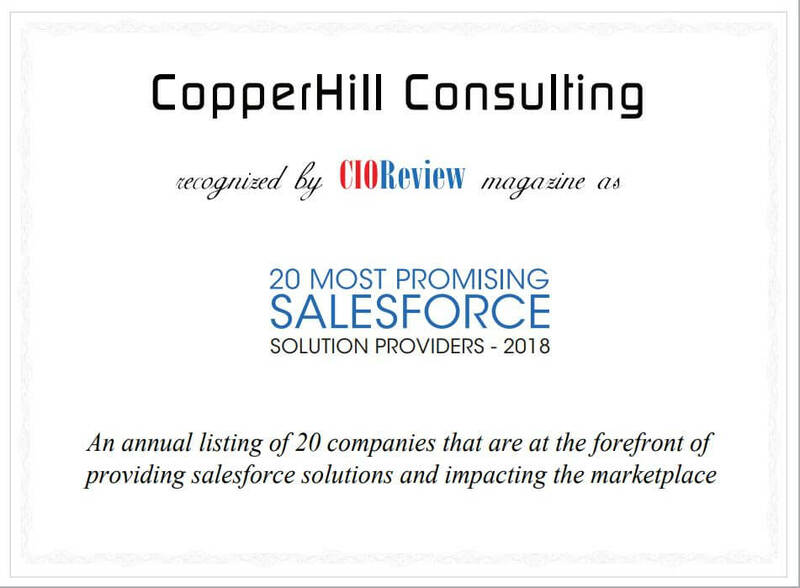 We are excited to announce that CopperHill Consulting was named to CIO Review Magazine’s 20 Most Promising Salesforce Solution Providers of 2018. CIO Review recognized that CopperHill seeks to understand how a customer’s business is run, then adopts a common sales solution which helps companies eliminate time-consuming processes and streamline fragmented data. CIO Review also considered that CopperHill Consulting can work with clients to implement an omni-channel service experience around phone, web, chat, social, and field service when naming them to this list. Contact us to learn more about our Salesforce solution capabilities.